The new comedy show "Other Space" follows an inexperienced crew of space explorers as they try to navigate the unknown universe. A crew of less-than-stellar astronauts gets flushed down a "cosmic toilet" in the new comedy series "Other Space," which is streaming for free on Yahoo.com. The new show follows the adventures of the U.M.P. Cruiser, "an exploratory vessel that went missing in 2105." In the spirit of other space comedies like "Red Dwarf," "Other Space" follows the misadventures of space explorers who don't quite fit the image of Starfleet Academy graduates like James Kirk and Mr. Spock. 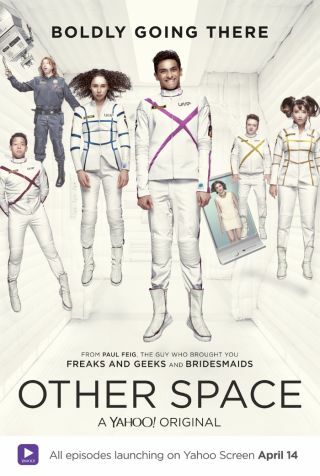 "Other Space" was created by Paul Feig, director of the movie "Bridesmaids" and creator of the beloved TV show "Freaks and Geeks." It stars Karan Soni, Bess Rous, Eugene Cordero and Milana Vayntrub. The eight-episode first season is available to watch for free here. In the pilot of the show, the audience learns about the "Universal Mapping Project," or UMP, which was established in the mid-20th century to explore the known universe. After 50 years of discovering little more than "rocks and dust," public enthusiasm for UMP has dwindled. With a minimal budget, the agency hires a crew of young, inexperienced recruits to go on a yearlong mission. The captain of the ship, Stewart Lipinski (Karan Soni), is capable and enthusiastic, but is otherwise the opposite of typical captain types: He's socially awkward, and physically and emotionally fragile. Second in command is his extremely aggressive older sister, who is clearly more qualified for the top job. The rest of the crewmembers are wonderfully peculiar and mostly inept. The futuristic spaceship's engineer (played by Joel Hodgson) has had his brain cooked by years of exposure to "engine radiation," and his deepest desire is to find a free tuna sandwich. The ship scientist (played by Neil Casey) admits he was only hired because his mother is chairwoman of UMP, and his inability to lie has far more hilarious results than Mr. Spock from the "Star Trek" series — who also could not lie — ever achieved. "Other Space" has the feel of shows like "Community" and "30 Rock" — the level of absurdity seems to prevent it from getting too serious, although it definitely has heart. But there's also room for a dose of science fiction and subtle references to the category of serious TV shows set in space.